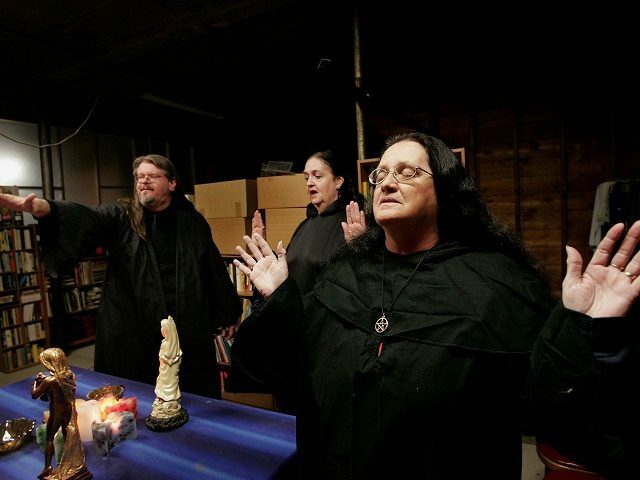 In two very contrasting news stories this weekend, witches who believe they have already cast a "hex" or "curse" on President Trump, will now publicly convene on October 20 to cast a "curse" on Brett Kavanaugh. 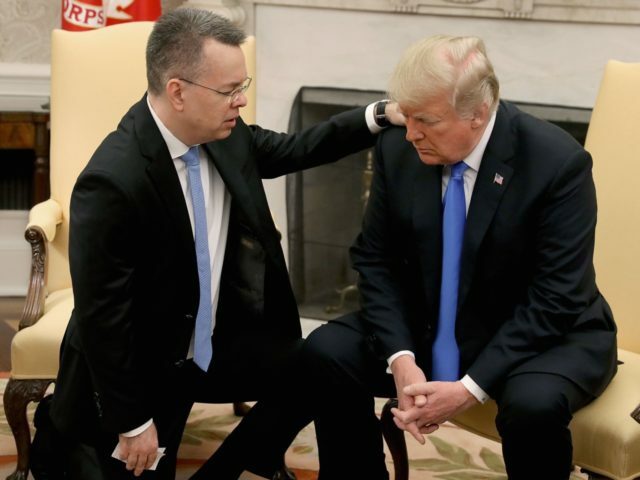 In contrast, Pastor Andrew Brunson, just released from a Turkish prison, knelt beside President Trump and along with his wife, laid hands on the president and prayed for God's wisdom and strength for him. A large group of witches will be convening in Brooklyn this coming Saturday, October 20, to "place a curse on Brett Kavanaugh and upon all rapists and the patriarchy which emboldens and rewards and protects them." Dakota Bracciale, a "queer, non-binary witch," who is leading the curse ritual, told the Huffington Post that "Witches use hexes as a radical act of resistance against oppressors." She says, "Witchcraft has been used throughout history as a tool and ally for people on the fringe of society who will not really ever get real justice through the powers that be" so the witches "have to exact their own justice." "Witchcraft," she says, "can offer the means of 'exacting justice that would otherwise be denied'." She says hexes or curses are "not something you do lightly, but it is something you have in your arsenal or toolbox." Well, she's right about not taking this event lightly. They are selling tickets to the event and are sold out---all 1,000 tickets are gone. To accommodate more people, the ritual will also be streamed live online from their Brooklyn, New York location. Their website explains that 50% of the proceeds from the event will go to charity, with 25% of all proceeds going to Planned Parenthood. Some of this same group convened at midnight on February 24, 2017 to use black magic to subjugate President Trump. In a lengthy incantation, calling on spirits and "demons of the infernal realms" to bind Trump so that he "may utterly fail." They promised to continue the rituals until President Trump has been removed from office. Bracciale says the difference between a "hex" and a "binding spell" is that a "spell" prevents someone from doing something and limits his ability to act." "A hex," she explains, "is a more direct attack that engages its target in a supernatural fistfight." She says, "Even if you don't believe in the magic of it...you will feel a sense of fellowship and camaraderie---we're not leaving you alone with the monsters." Any contest between good and evil was settled at the cross, when Christ gave His life for our sin. Had he remained in the grave as all other religious leaders have, the contest may have continued, but it is finished. Christ overcame Satan crushing him and assuring he will ultimately be cast into the Lake of Fire. Satan's power is only in his ability to deceive. Can a Christian be cursed or hexed? A Turkish court has released American Pastor Andrew Brunson after two years of confinement. His return home over the weekend has been a profound moment for evangelical Christians and others who have prayed earnestly for his deliverance and release. President Trump has been true to his promises to the evangelical community---formally recognizing Jerusalem as the capital of Israel, installing hundreds of conservative jurists on federal courts, two originalists on the Supreme Court---and more. In fact, according to the records, he has done more for the evangelical community than any other president in modern history. This was another kept promise. The Trump administration put extreme pressure on the Turkish government to release the pastor, without paying any kind of ransom. In contrast, President Obama gave the Iranian government over $1 billion dollars to release a couple of prisoners during his administration. In a touching moment in the White House on Saturday, Brunson knelt and prayed for the president, asking God to give him wisdom to lead this country and the strength to fulfill his plans for governing it. Brunson's wife, Norine, joined him in the laying on hands and praying for the president. "Greater is He that is in you, than he that is in the world" (I John 4:4). "No weapon formed against you will prosper; and every tongue that accuses you in judgment you will condemn. This is the heritage of the of the servants of the Lord, and their vindication is from Me, declares the Lord" (Is. 54:17). "Submit yourself to God, resist the devil, and he will flee from you" (James 4:7). Be Informed. Be Vigilant. Be Steadfast. Be Prayerful. Be Blessed. Let all those curses go back to wherever they came from. To do such things is a treasonous act. I should be expecting their witch's meeting to be stormed by Homeland Security, the FBI, or the police, right? There should be arrests made, right? It is a blatant violation of freedom of speech, to organize such things, for the overthrow of the nation. We have a system of voting, and speaking, talking to representatives, as well as each other, not going way beyond the constitution, way outside of it. We forebear a lot of things under freedom of speech, but this goes too far. Some things should not be tolerated, things that are clearly contrary to our constitution. When witches start gathering to hex Trump and Kavanaugh, voters should know for certain that these witches are on the same side as the democrats, which is not God's side. If Trump or Kavanaugh were the evil ones, the devil would let them alone and so would his children, the witches.Trump is doing so much good for America, honoring the devil's enemy, the Jewish people, and preserving the rights of Christians, also the devil's enemy, America, that they can't stand it.